On Monday, January 28, the Longmeadow Select Board met at the Longmeadow Fire Station to choose a new Town Manager amongst three candidate finalists- Edward Del Rubio, Kevin O'Donnell and Stephen Crane. Public interviews were held last Thursday, January 24 and these interviews are available for viewing on the LCTV website. I watched the three interviews last week and felt that Stephen Crane was the #1 candidate and would be a great addition to the town despite having limited managerial experience with Massachusetts municipal government. 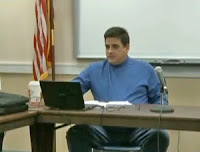 Below is a short video clip (20 minutes, courtesy of LCTV) of the SB deliberations in which Stephen Crane was selected and a motion was approved to extend a conditional offer of employment to him. As of today, a contract offer has been offered to Mr. Crane and the SB will meet later today at 5 PM in executive session to discuss this contract. Below is a chart showing the initial polling of choices by SB members. It's worth watching the short video to see how Stephen Crane was selected. Mr. Santaniello clearly did not support the selection of Mr. Crane and made comments that Mr. Crane was not qualified to be Longmeadow's next TM because of his lack of experience. These public comments were made even though the "super majority" vote of 4:1 was assured when Mr. Gold's shifted his support to Mr. Crane. Let's hope that the contract negotiations go well and that Mr. Stephen Crane becomes our new Town Manager and he gets strong support by all Select Board members including the Chairman.